Suzhou is located in the southeast of Jiangsu Province, owns a beautiful landscape known as ''Heaven on the Earth''. Since ancient years, this city has been benefited from its favorable geographical location. The Grand Canal of Sui Dynasty (581-618), which flows from Beijing to Hangzhou, capital of Zhejiang Province, has irrigated Suzhou, aiding its illustrious culture and turning it into a civilized and prosperous land. Suzhou is built by He Lv, the King of Wu, in 541 B.C. during the Spring and Autumn Dynesty, the 2,500-year-old Suzhou is cradle of Wu culture. The 8,483-square-km city proper abounds with historical and cultural legacy. It has been chosen as one of China's 24 historical and cultural cities and one of the four tourist cities with top environmental protection (the other three are Beijing, Hangzhou and Guilin). Suzhou is a key silk production center in China and its embroidery is one of the country's four major schools. Its allure also lies in its performing arts including folk songs of Wu, Kunqu Opera, and storytelling, as well as stelle carving, calligraphy and paintings. One of the four renowned gardens in Suzhou, Liuyuan, or Lingering Garden, was first built in the Ming Dynasty (1368-1644)and was rebuilt by a Qing official. Its Taihu Lake rocks boost its reputation both at home and abroad. The core of the two-hectare garden is a pond, with hills to the northwest and buildings to the southeast responsible for a good many of the contrasting effects. The eastern section features mainly halls and courtyards. The imposing Wufengxian (Five-Peak immortals)Hall is the largest hall of all the Suzhou gardens. The western section is dotted with vegetation whereas the northern section is reminiscent of a peaceful countryside. An exemplary work of classic gardens in southern China and one of four famous gardens in Suzhou, it was built in 1509. Wangxianchen gave his garden this name, meaning humble Administrator's Garden, because it was built after he was dismissed from the imperial court. The design makes good use of the natural terrain. This five-hectare garden is centred on a pond and includes pine forests, hills, bamboo groves and meandering streams.The yuanxiang (Distant Fragrance) Hall in the middle section is surrounded by numerous scenic interests, such as ponds, rocks and pavilions. Looking through the hall windows,the beautiful things unroll before your eyes just like a Chinese landscape painting. Hangzhou, capital of Zhejiang Province, is at the southern end of the Grand Canaland and one of China's seven ancient national capitals. When Marco Polo came to Hangzhou in the 13th century he declared that "it is the most beautiful and elegant city in the world". There is a popular saying: "Above there is heaven, below there are Hangzhou and Suzhou." Hangzhou's "heavenly" beauty attracts hundreds of thousands of tourists to its exquisite West Lake (Xi Hu) area each year to enjoy the placid lake, beautiful gardens, reflecting pools, lavish temples and friendly lakeside teahouses. First built over 2,200 years ago, Hangzhou is one of the cradles of Chinaâ€™s civilization. Hangzhou used to the capital of Wu and Yue States in the 10th century during the Five Dynasties period. The city began to prosper and flourish in the Tang Dynasty. The city had its political heyday in the Southern Song Dynasty when it served as the capital. Hangzhou witnessed rapid commercial boom in the Ming and Qing Dynasty. In and around Hangzhou, tourists find the well-known West Lake which is surrounded by forested mountains and many more historical sites. Hangzhou is also well-known for silk and tea. A trip to Hangzhou is easily combined with a visit to a tea plantation in the hills near the West Lake. Dating back to more than 2,500 years, Suzhou is one of Chinaâ€™s oldest cities. After the completion of the Beijing-Hangzhou Grand Canal the city began to thrive during the Sui Dynasty. Suzhou served as the centre of silk trade along the bustling waterway. Marco Polo once marvelled at the cityâ€™s prosperity and he recorded that its inhabitants were comprised of â€œprudent merchants, and, as already observed, skilful in all the artsâ€™â€™. Polo noted that a number of the Suzhou people were learned in natural science, were good physicians and able philosophers. In Poloâ€™s words, the city of Suzhou was â€œgreatâ€ and â€œnobleâ€. During the Ming Dynasty, the industry of massive silk production developed in Suzhou. As a result, the local culture boomed and the Kunqu Opera and Pingtan Song were established. Sadly, Suzhou witnessed fatal destruction during the 1860s when the Taiping Heavenly Kingdom rebellion occupied the city. The period during World War II was also a nightmare for Suzhou when the Japanese army ravaged the city and left many ruins. Since the foundation of the Peopleâ€™s Republic of China in 1949, Suzhou has undergone stages of renovation and it has once again rightly reclaimed its fame. It has been chosen as one of China's 24 historical and cultural cities and is one of only four tourist cities with top environmental protection (the other three being Beijing, Hangzhou and Guilin). In 1997, Suzhou caught the world's attention by having its classic gardens placed on the UNESCO list as a World Cultural Heritage site. While Hangzhouâ€™s history can be dates back more than 50,000 years to the Paleolithic Period, â€œ modernâ€ Hangzhou began over 2,200 years ago. During the Five Dynasties and Ten Kingdoms Periods, Hangzhou served as the capital of Wu and Yue Kingdoms. The city gained its importance when the Grand Canal was built in the Sui Dynasty. With Beijing as the northern terminus and Hangzhou as the southern terminus, the legendary waterway served as a significant transport link between the north and south China. Hangzhou witnessed rapid economic and cultural development in the Tang Dynasty when the famous West Lake, now a famous tourist attraction, was created on the western edge of Hangzhou. An old harbor was also filled in, greatly expanding the size of the city. Hangzhou witnessed political and economic prosperity in the Southern Song Dynasty when it was established as the capital. Marco Polo once visited the city during this period and was amazed to see millions of people, bustling streets and busy river and canal traffic. The Song Dynasty Town, a recreation of a Song town will allow visitors to briefly experience the cityâ€™s prosperity in the Song Dynasty. Although Southern Song Dynasty was sacked by the Mongols, Hangzhou continued to prosper through its river and sea trade, ship building, and naval industries. The city was opened to foreigners in 1895 under the terms of the Treaty of Shimonoseki. Today Hangzhou, with its the West Lake is one of Chinaâ€™s top tourist destinations. Recognized as one of the eight major schools of cuisine in China, Hangzhou food is characterized by its light flavors, enjoyable presentation and delicate cooking methods. Hangzhou cuisine makes crisp, tender, light and fresh dishes. The most famous dishes include West Lake Fish in Sweet and Sour Sauce, Shelled Shrimp with Dragon Well Tea, West Lake Water Shield Soup and Dongpo Pork. It is prepared with a West Lake grass carp, weighing about 0.5kg and starved for two days, as its main ingredient. Boiled for three minutes and then sugar and vinegar sauce is poured over it.The fish tastes delicious with a taste similar to crab. 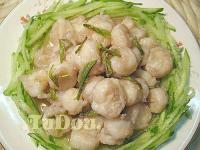 This dish is prepared with the shelled fresh water shrimps and the well-known Dragon-Well green tea leaves. It is beautiful in color has special tastes. Prepared with the West Lake Water Shield (a plant that grow in West Lake) and minced chicken slice, it tastes fresh and delicious. 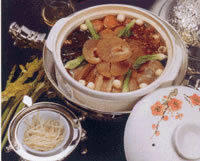 It is cooked by braising fine-skinned and thin pieces of fat streaked pork with famous Shaoxing wine in a sealed pot. When the dish is ready, the pork will be moist and red, and the sauce well be thick and tasty. 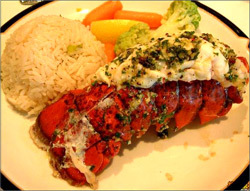 It tastes savory, sweet and full of body, but not greasy. Bean-curd roll into small segments, then deep fried. The bean-curd rolls are golden and taste crispy with a faint scent of soybean. The chicken is cramed with fried pork and wrapped with lotus leaves. It is soaked in Shaoxing wine and coat it with a layer of mud from the wine jug. When the mud is baked dry it smash it to break off the clay. This dish is tender, fresh, juicy, crisp, tasty and full of the fragrance of lotus. Built in the 1840s by a Qing Dynasty Noble, Louwailou Restaurant is said to be the oldest restaurant in China. Many foreign heads have dined there when visiting this city. The Restaurant features authentic Hangzhou cuisine. Tasty food served including West Lake Carp in Sweet and Sour Sauce, Beggarâ€™s Chicken as well as Dragon Well Tea served with snacks. Opening time: Open daily 11:30am-2:30 pm and 4:30 pm-8:30 pm. This is also a very old restaurant first opened in 1910. its nice location close to the Lingyin Temple, tasty seafood and warm service make the restaurant very popular eating place for tourist. Address: No 2 Tianzhu Road, outside the Peak Flown from Afar Park entrance.